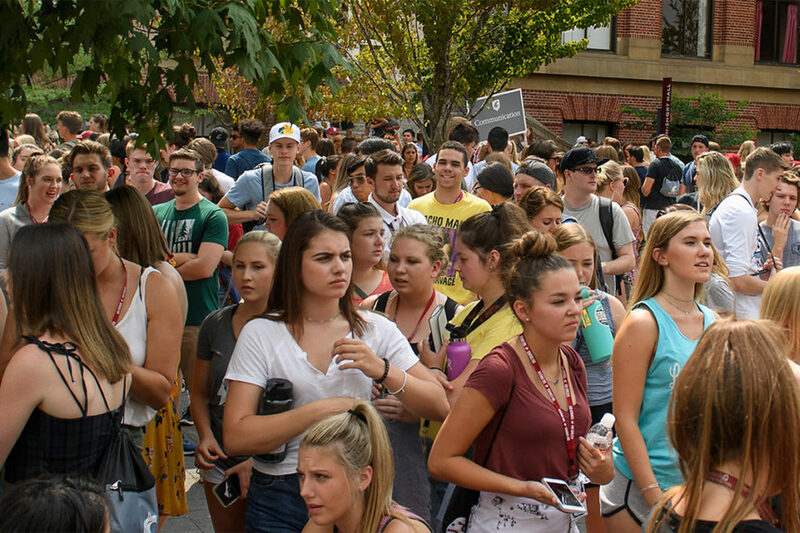 Students crowd the Terrell Mall on the WSU Pullman campus. Moms and dads who encourage candid talk about college life can help their children survive and thrive amid the tricky transition to higher education, says a Washington State University scientist. “The first semester of college is often the riskiest time for students,” said Matt Bumpus, an associate professor who researches parent-child relationships in WSU’s Department of Human Development. Freshman year brings excitement and independence, but also risky opportunities for substance abuse and other unhealthy behaviors. Bumpus co-leads a five-year, $2.4 million research project, funded by the National Institutes of Health, aimed at increasing resources for healthy parent-child relationships by exploring positive ways for parents to support their college-age students. “I’ve always been interested in family relations and how families navigate transitions,” Bumpus said. A parent himself, he experienced how parenthood changes when children leave home. While many guides exist for parents of young children, Bumpus says there’s a dearth of models for parents whose children are grown and headed to college. To help, he and WSU Human Development colleagues Laura Hill and Brittany Rhoades Cooper created a handbook aimed at supporting families across the transition to college. The book, “First Years Away from Home: Letting Go and Staying Connected With Your WSU Student,” walks them through new roles they can play in their children’s lives, and helps spark conversations and activities that build supportive relationships and create shared expectations and values. “Moms and dads don’t want to be ‘helicopter parents,’ hovering over their child’s lives,” Bumpus said. Through the handbook, he offers new roles for parents—as coaches, cheerleaders and safety monitors. “As a coach, you’re processing with them, behind the scenes, helping them think through decisions, but you’re not on the court, playing the game,” he said. “Your student is in the driver’s seat. Parents who are safety monitors share the importance of making careful choices. Regardless of role, every parent should talk with their students about their goals and values. 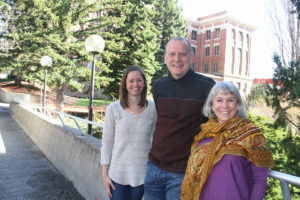 Brittany Cooper, Matt Bumpus and Laura Hill, WSU Human Development researchers, explore how parents can help their college-age children stay safe and succeed during their transition to university life. “As parents, we make a lot of assumptions about what our children will do in college—will they get a job, get involved on campus, get straight A’s?” Bumpus said. “But those assumptions might be ours alone,” and students will have their own ideas about what college is all about. Using checklists and activities—such as a card game about expectations like fiscal responsibility, dating and relationships, and alcohol use—the handbook gives parents a starting point for family conversations. Campus visits, such as the upcoming Mom’s Weekend at WSU, are also opportunities to revisit conversations on choices and values. “We’re giving parents permission and resources to have those real talks,” Bumpus said. As part of the study, which is funded by the National Institute of Drug Abuse, the researchers are surveying members of the past two incoming classes, learning how the handbook and other resources are helping parents and students. “We’ve never done a full-scale study of its impact, until now,” he said. Early results show the conversations inspired by the book help new students avoid alcohol and drug abuse and other adverse behaviors. “We know that by having a conversation around values, what’s important, and what kind of person they want to be, our students are less likely to make bad choices, drink to excess, and get into trouble or danger—and more likely to succeed,” Bumpus said. Learn more about the Department of Human Development.